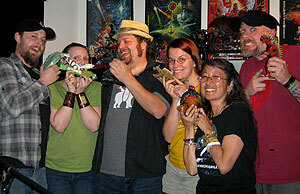 Justin, Heather, The Mad Marquis de Maltease, Sophie Maltease, Cindy and I talk about (and make a little fun of) the 1968 Gamera vs Viras. Wowzers – this is episode number FORTY. I find it kind of hard to believe that if you chose to do so, one could actually listen to us talk for two days straight! Now that the flabbergastation is waning, I should warn you that in this episode we open up the can of turtle soup and take a long look at a classic Gamera film and one of my favorites from the Showa era, Gamera vs Viras (1968). When I say “we” the audience consisted of Justin from the Going Last Podcast, my co-host Heather, my friend Cindy and some new additions to the Kaijucast roster: Sophie and the Mad Marquis de Maltease (the Marquis was on the last show) of Critical Hit Burlesque. Things got a little goofy because this Gamera film, although a LOT of fun, is ridiculous in many areas. In addition to the movie discussion, there are a lot of really relevant links down below that I talked about on the show -kaiju related stuff- and if you haven’t already learned of these developments, I highly suggest following those links! I didn’t play a lot of music in this episode, but it matches the tone of the film for sure (here’s what I did manage to play). Gojira to be put out by Criterion? “Fine Grain” print of Godzilla King Of The Monsters found! 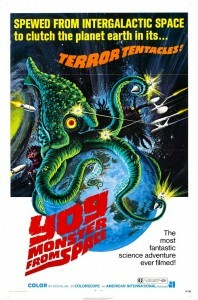 Yog Monster From Space (aka Space Amoeba) will be the focus of September's Daikaiju Discussion! Congrats to the winners of the signed Wondercon exclusive Godzilla comics: Jim S, Jonathan W, Ron A, Ernest D & Stephen S! 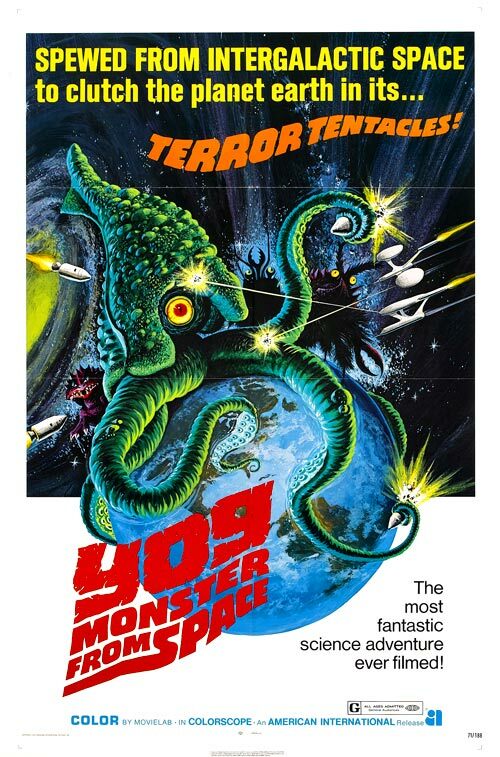 The month of September weilds not only a bunch of mighty birthdays (mine, Heather’s, Justin’s and I’m sure), but also heralds the coming of Yog, Monster From Space! We’ll be watching the Media Blasters/Tokyo Shock DVD of this close to/around the 25th, so make sure that you watch the film and send in any questions, comments and reviews before the last week of the month. Now this film is a bit of an oddity, but it has some really cool moments: A giant cuttlefish! Kenji Sahara with a goatee! Bats! And just checkout this rockin’ trailer if you need another reason! Email me with the subject line of “Daikaiju Discussion: Yog” and I’ll make sure to include your thoughts in the next discussion episode. The next episode will feature Adam from The Monster Project and we’ll talk about his CD and his recent trip to Japan. You can expect that to be online sometime around the 10th of September. I’m also very close to announcing another big contest, so stay tuned for that. Hope you enjoy the discussion!